References BaseFab< T >::define(), BaseFab< T >::m_aliased, BaseFab< T >::m_domain, BaseFab< T >::m_dptr, BaseFab< T >::m_numpts, BaseFab< T >::m_nvar, Box::numPts(), and BaseFab< T >::undefine(). Referenced by IVSFAB< T >::define(), FArrayBox::define(), BaseIVFAB< T >::define(), BaseIFFAB< T >::define(), and BaseFab< bool >::define(). Referenced by BaseFab< T >::degenerate(), and BaseFab< T >::testBoxAndComp(). Referenced by BaseFab< T >::contains(), BaseFab< T >::copy(), BaseFab< T >::degenerate(), PetscSolverFAB< LevelData< FArrayBox > >::getRegFab(), BaseFab< T >::performCopy(), BaseFab< T >::setVal(), and BaseFab< T >::testBoxAndComp(). Referenced by BaseFab< T >::getVal(), and BaseFab< T >::testBoxAndComp(). Referenced by PetscSolver< T >::create_mat_vec(), BaseIVFAB< T >::define(), and BaseIFFAB< T >::define(). Referenced by BaseFab< T >::copy(), and BaseFab< T >::degenerate(). Referenced by BaseFab< T >::BaseFab(), FArrayBox::define(), and BaseFab< T >::resize(). References CH_assert, Box::contains(), BaseFab< T >::m_domain, BaseFab< T >::m_dptr, BaseFab< T >::m_numpts, and BaseFab< T >::m_nvar. Referenced by BaseFab< T >::bigEnd(), BaseFab< T >::box(), BaseFab< T >::clear(), BaseFab< T >::copy(), BaseFab< T >::define(), BaseFab< T >::getVal(), BaseFab< T >::hiVect(), BaseFab< T >::loVect(), BaseFab< bool >::offset(), BaseFab< T >::operator()(), BaseFab< T >::performSetVal(), BaseFab< T >::resize(), BaseFab< T >::setVal(), BaseFab< T >::shift(), BaseFab< T >::shiftHalf(), BaseFab< T >::size(), and BaseFab< T >::smallEnd(). Referenced by BaseFab< T >::clear(), BaseFab< T >::contains(), BaseFab< T >::copy(), BaseFab< T >::dataPtr(), BaseFab< T >::define(), BaseFab< T >::getVal(), BaseFab< bool >::interval(), BaseFab< T >::nComp(), BaseFab< T >::nCompPtr(), BaseFab< bool >::offset(), BaseFab< T >::operator()(), BaseFab< T >::performSetVal(), BaseFab< T >::resize(), and BaseFab< T >::setVal(). Referenced by BaseFab< T >::clear(), BaseFab< T >::dataPtr(), BaseFab< T >::define(), BaseFab< bool >::offset(), BaseFab< T >::operator()(), BaseFab< T >::performSetVal(), and BaseFab< T >::resize(). 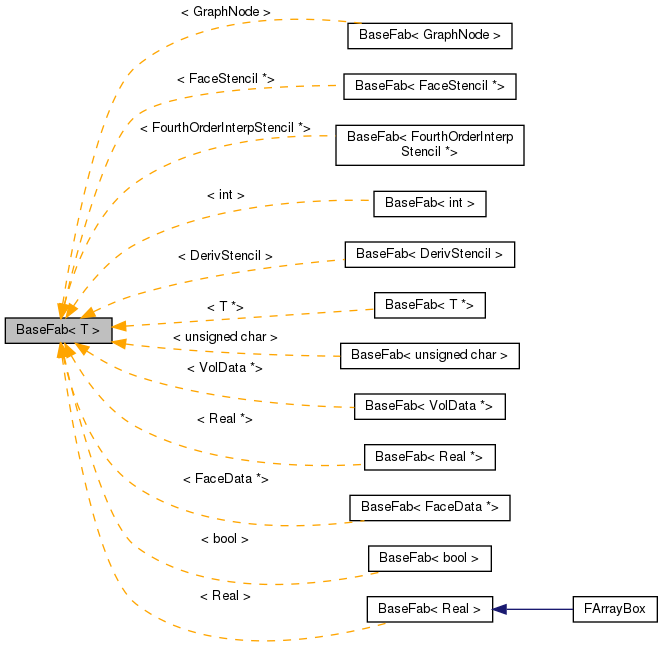 Referenced by BaseFab< T >::BaseFab(), BaseFab< T >::dataPtr(), BaseFab< T >::define(), BaseFab< T >::getVal(), BaseFab< T >::nCompPtr(), BaseFab< bool >::offset(), BaseFab< T >::operator()(), BaseFab< T >::performSetVal(), BaseFab< T >::resize(), and BaseFab< T >::undefine(). Referenced by BaseFab< T >::BaseFab(), BaseFab< T >::define(), BaseFab< T >::isAliased(), BaseFab< T >::resize(), and BaseFab< T >::undefine().